This is a quilt block decorative pattern or paperweight. It is made using diamonds and triangles from different kinds of wood, all in their natural colors. There are 16 pieces on this block, 8 diamonds and 8 triangles, all full size. It measures 3 1/2” across. To finish them, I use 1 coat of full strength varnish brushed on, and 3 coats of wiping varnish rubbed in by hand. The type of wood is listed on the bottom from the center out. 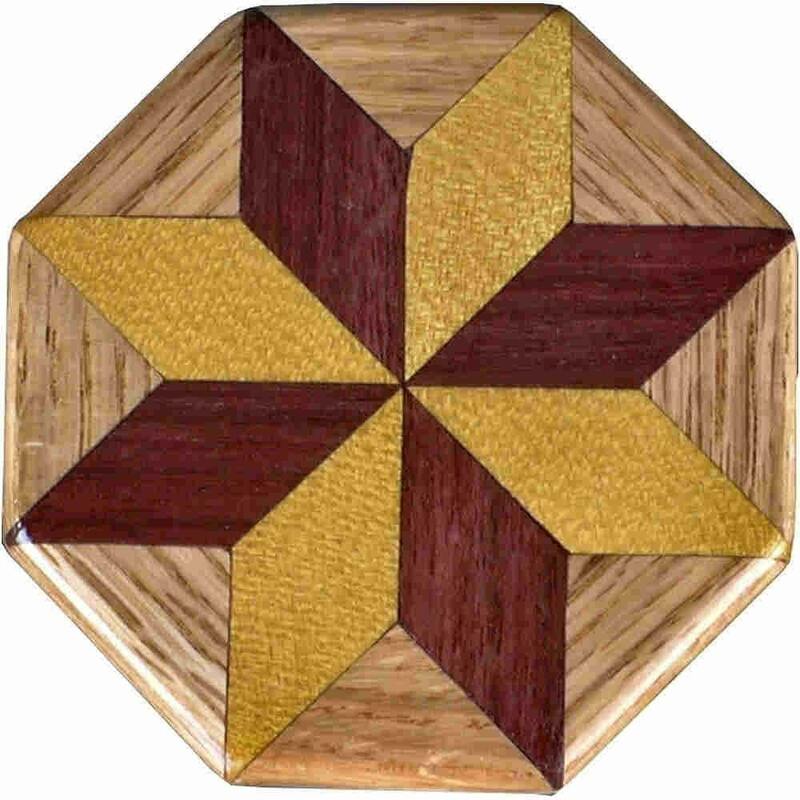 On this quilt block the wood is “Satinwood” from Brazil (a very pretty yellow wood), “Purple Heart” from Central or South America (a very bright purple wood) and “Oak” from Missouri. I made this pattern weight in 2004. On the bottom I signed it, listed the wood, and dated it. After the date, the words “Foot Cut” let you know I made it on a foot powered table saw. Go to my ”Shop Polices” and “Profile” page to see my return policy and other information on how I make these. To see other quilt blocks I’ve made, click on “Quilt Blocks Under 25.01” or whatever gets your interest under “Sections in this shop”. The “Home” page itself can be rather confusing with everything mixed up. The “Sections in this shop” lets me show you all like items together as a unit.